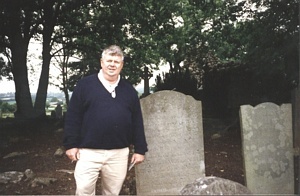 Our third trip to Ireland to try yet again to penetrate the mist surrounding the lives of my great grandfather, John Nolan, and John's family in the Emerald Isle was in June, 1997. As with the trips in 1986 and 1991, my wife, Betty, was with me. Our son, Casey, had graduated from college the previous month and his idea of a celebration did not embrace accompanying Mom and Dad to Ireland. So while we were in Ireland, he did the late 20th Century version of the Grand Tour on the Continent, on the cheap with friends. I was fresh from the relaxation that followed my decision earlier in the year to retire early from the corporate world. (Faced with rising blood pressure, I had left Guardsmark, Inc., in February, 1997, where I had served as Vice President Communications and Government Affairs since shortly after accepting an early retirement offer from Schering-Plough in mid-1996). I was happily in good health at age 54 and was eagerly anticipating a breakthrough in my decade-long search for some hard evidence that John Nolan had indeed lived in Ballinasloe, County Galway, in the west central part of Ireland before emigrating to America in 1843. With some welcome free time on my hands due to my retirement (cut into by some occasional consulting for Guardsmark, which lasted until late 1998) I had been able to prepare for this trip much more thoroughly than for our trips to Ireland in 1986 and 1991. Those trips were covered in my earlier book, "Nolan-Family History," which was printed shortly before the 1997 trip commenced. Ireland, in the southeast section known as Leinster. It included a semi-circular driving tour around the Southeast and Southwest coasts as well as a return to Ballinasloe to the north, in the central part of Ireland roughly midway between Dublin and Galway. We had wanted to visit places we had never seen before, including Waterford, the wild and windy Dingle Peninsula, Donegal and Northern Ireland. With the rising interest in Ireland - and also in the U.S. - about the Great Famine of the 1840s, I had also wanted to spend some time at the Famine Museum in Strokestown and some other grim reminders of the cruel treatment of the Irish by their former English masters. Carlow was the ancient home of the Nolan "sept," an Irish term denoting a tribal unit combining government and kinship. Three centuries ago, the Cromwellian horrors pushed the rebellious Irish off their land and to the rocky terrain of Connaught in western Ireland. The sparsely populated County Carlow is in Leinster, south of Dublin. Unlike our previous trips - that had us flying out of Delta's hub in Atlanta in 1986 and American's hub in Dallas in 1991 - this time we had a direct flight from Memphis to Europe due to the alliance between Northwest Airlines and KLM, the Dutch airline. Huge KLM jets fly nonstop from Memphis to Amsterdam's gigantic Schipol Airport several times a week. I had flown business class on KLM the previous August while traveling from Memphis to Germany on behalf of Guardsmark; I liked the KLM service well enough to take the overnight flight again, requiring a connection in Amsterdam to Dublin. However, I soon found out that KLM has far less gracious standards of service for its economy class passengers. Besides, I've never much liked Dublin. We'll probably be back on Delta next time, which will put us into and out of Shannon Airport on the beautiful West Coast rather than dingy Dublin and its confusing traffic. One of Betty's friends - the terrific Betty Hoffman who has cheerfully provided us airport transportation at odd hours for many years - drove us to Memphis International Airport at 6 p.m. to start our long-awaited return to Ireland. The trip was our "graduation present" to ourselves. It marked our son Casey's graduation from the University of Virginia May 18 and the end of our paying for his out-of-state tuition and college expenses. His graduation present was a trip to Europe; he is there now with two college pals, staying in hostels and cheap hotels while traveling around with Eurorail passes from London-Paris via the Chunnel, Barcelona, Rome, Corfu, Athens, Budapest, Prague and Amsterdam. We had invited Casey to join us in Ireland, but are doubtful that we'll see him until we return home June 26. He flies back to Washington June 18 and will drive to Memphis two days later for a short visit. He has to quickly return to Charlottesville to move his gear to an apartment near Bethesda, Md., where he starts work as an Office Engineer at Clark Construction June 30. (Casey was later transferred to Palm Springs, Calif., in 1998 to help build a stadium tennis complex). As we head towards Ireland, we have some mixed feelings. Betty and I are taking our first major vacation by ourselves since Casey's birth 22 years ago. 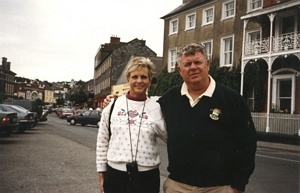 This is our third trip to the Emerald Isle and having him along added much to the fun to our trips, including our vacations in Ireland in 1986 and in 1991. That was especially the case on the last one, when Casey and I enjoyed sharing the experience of playing golf on some of the finest courses in the world - Ballybunion, Killarney and Waterville. Nonetheless, Betty and I have been eagerly anticipating this trip as in a way it is a new beginning for us "empty nesters." Our chick has flown the nest but I'm looking forward to playing some new courses, even if by myself. I'm carrying my clubs along, with a dozen TopFlite Magna balls. Betty and I have become experienced international travelers as we are now on our fourth trip to Europe and have also been to Mexico and the Caribbean Islands several times. We have learned to pack light, except for the mandatory golf clubs. I'm not even taking a necktie this time since I've learned how casual the Irish are - sometimes to the point of being surprisingly scruffy given the penchant of many Irish Americans to be dapper dressers. Arriving at the Memphis airport, we found that check-in was the usual mess. A group of Arabs also bound for the KLM direct flight to Amsterdam had way too many bags, weighing way too much. Another group of Arabs was accompanying a youngish male companion who was laid out on a push-bed, paralyzed and possibly returning home following treatment in one of Memphis' renowned medical facilities. KLM's beefy attendants rigged up a cot of sorts for him on the plane, requiring the space of eight seats. The flight was a little late getting off the ground due to overbooking and it was completely full. I was tempted to go for the offered $750 flight vouchers in return for traveling the next day, but decided to stick with what we had. It was just before 9 p.m. when we took off for the 4,500-mile trip and we expected to be in the air for 8 hours and 23 minutes. I know I'll be like a caged bear by the time we get to Amsterdam at noon local time tomorrow for a connecting Aer Lingus flight to Dublin. I brought some muscle relaxers with me and will take one with some wine after dinner to help me sleep. The combination, recommended by a pharmacist we deal with, worked like a charm on my last flights to and from Amsterdam. Sleep on the overnight KLM flight was fitfull at best. We were crammed into the seats, with sub-minimal spacing for both width and pitch. It's almost criminal what the airlines are doing to maximize their load yield, and thus their profits, at the expense of passenger comfort and safety. In an emergency, most people would not be able to extricate themselves from their seats. One of the KLM attendants got huffy with me when I asked for a refill of a cup of water, saying that if every passenger did so she would not be able to serve everybody. Another lesson learned: Bring your own bottle of water, along with some peanuts or other snacks. Today's crowded flights, compounded by understaffing, mean you can't depend on the level of service enjoyed only a few years ago. On the positive side, the fact that so many Americans are traveling points to the benefits of a strong economy.